What's The Coolest-Looking Intake Manifold? After watching the '90 Taurus SHO commercial, I got to wondering about other engines with great-looking intakes. You know, the kind you'd like to clean up and hang on your wall as fine art. There's the whole family of Chrysler cross-ram intakes of the early 1960s, and they get added coolness points for sporting names such as Sonoramic. You got your Porsche 928 and your Audi RS4 (see photo, above). I've got a soft spot for backyard-built intakes, such as this sheet-metal job on the Theoretical Racing 280ZX 24 Hours of LeMons racer. OK, fine, it causes a slight case of fuel puddling, but that just makes the car look better on the track! 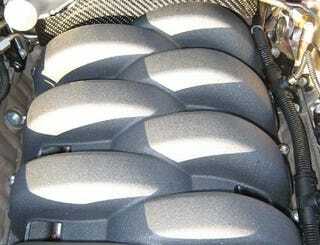 So, what's your favorite intake? Why?